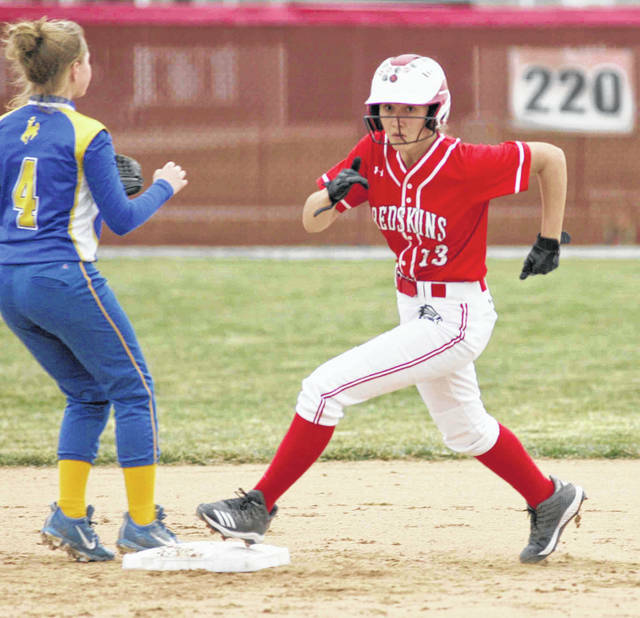 Wapakoneta’s Alex Daum rounds second on the way to third base during Friday’s game against St. Marys at Wapakoneta. WAPAKONETA — Wapakoneta’s Alex Daum got the job done on the mound and then capped off her big pitching performance by driving in the final three runs against St. Marys to close the door on the victory and give the Redskins a 10-0 five-inning run-rule win against St. Marys in a Western Buckeye League clash Friday. Wapakoneta improves to 4-2 overall and 2-0 in WBL action. St. Marys slips to 1-3 for the season and 0-2 in league play. Daum scattered four hits over her five innings while striking out four and walking one. At the plate Daum went 1 for 3 with a triple and 3 RBI. The three-bagger scored the final three runs of the game. Sammons added that this year Daum has done a better job of keeping opposing batters off-balanced. “She is not overpowering and she is not extremely fast but she keeps people off-balanced and this year she is keeping people more off-balanced because of her curve ball that is really starting to break much more,” Sammons said. The Roughriders were coming off a 22 run performance the night before against Ottoville but could not repeat that against Wapakoneta. Daum is part of the youth movement but on this night the Redskins played like a veteran squad despite a couple of fielding and base running miscues. One of the early turning points in the game came in the first inning. St. Marys had runners on second and third with one out that was highlighted by a double from the bat of Karsyn McGlothen. But the golden run scoring opportunity came to an abrupt end when the next Roughrider batter hit a line drive to the shortstop who promptly threw to second for the double play. Inning over. Sammons, who admitted the team has had some early fielding issues, said the team has been improving and the Redskins rallied around that big defensive play. Like Wapakoneta, St. Marys also sports a young team but unlike their counterparts they showed their age by committing five fielding errors that led to six of Wapakoneta’s run. In addition to Wapakoneta taking advantage of the Roughrider mistakes, the Redskins also delivered several clutch hits. Triples came off the bats of Tianna Thompson, Katie Lisi and Daum and Allie Watson drove in two runs.